League Two Annan Athletic stunned Premiership Hamilton Academical in the fourth round of the Scottish Cup. Matt Flynn's strike gave the hosts an early lead and Josh Todd's shot doubled their advantage shortly after the break. Greg Docherty's effort reduced Hamilton's deficit midway through the second half. However, two goals from Rabin Omar - both right-foot shots - secured a famous win for Jim Chapman's side. Annan, who joined the senior ranks of Scottish football in 2008, enter Monday's fifth-round draw after one of the most famous results of their 74-year history. It was the Galabank side's first win against top flight opposition and it was as emphatic as the scoreline suggests. Accies travelled south with just one win in their 13 previous games and soon found themselves up against it when a Jesus Garcia Tena miskick presented Annan with an opening after six minutes. Omar gathered the loose ball and prodded it through for Flynn, who took a touch before beating Michael McGovern. The Northern Ireland goalkeeper then had to look smart to keep out Peter Weatherson's volley. Rattled by the loss of an early goal, Hamilton lacked composure, although Ali Crawford went close with a free-kick while Michael Devlin headed over from a corner. Todd shot wide after racing clear late in the first half but made amends soon after the restart when he latched on to a Weatherson pass before stroking a cool finish past McGovern. Eammon Brophy was guilty of a horrible close-range miss before he set up Docherty to fire home a lifeline. But the part-time hosts responded within 60 seconds they broke upfield from kick-off, with Omar slotting home at the second attempt from Todd's cut-back. Todd had run the visitors ragged but he somehow failed to net from a yard out when slammed against the post after McGovern spilled Weatherson's free-kick at his feet. But the home element of the 817 Galabank crowd were celebrating once more as Omar dinked home the fourth after a Ryan Finnie set-piece was deflected his way. 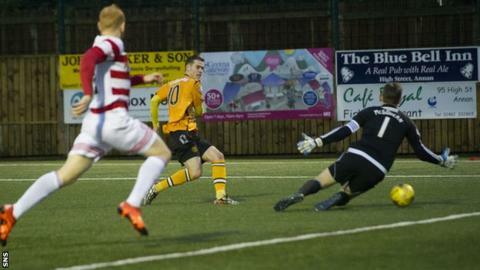 Match ends, Annan Athletic 4, Hamilton Academical 1. Second Half ends, Annan Athletic 4, Hamilton Academical 1. Substitution, Annan Athletic. Liam Park replaces Matthew Flynn. Substitution, Annan Athletic. Greig McDonald replaces Peter Weatherson. Substitution, Hamilton Academical. Darren Lyon replaces Greg Docherty. Corner, Hamilton Academical. Conceded by Peter Watson. Attempt missed. Peter Weatherson (Annan Athletic) left footed shot from outside the box is close, but misses to the right. Attempt saved. Greg Docherty (Hamilton Academical) right footed shot from outside the box is saved in the bottom left corner. Josh Todd (Annan Athletic) is shown the yellow card for a bad foul. Carlton Morris (Hamilton Academical) wins a free kick on the left wing. Rabin Omar (Annan Athletic) is shown the yellow card for excessive celebration. Goal! Annan Athletic 4, Hamilton Academical 1. Rabin Omar (Annan Athletic) right footed shot from the centre of the box to the high centre of the goal. Substitution, Hamilton Academical. Carlton Morris replaces Alejandro D'Acol. Attempt saved. Peter Weatherson (Annan Athletic) right footed shot from outside the box is saved in the bottom right corner. Substitution, Annan Athletic. Smart Osadolor replaces Ryan McStay. Goal! Annan Athletic 3, Hamilton Academical 1. Rabin Omar (Annan Athletic) right footed shot from the centre of the box to the high centre of the goal. Assisted by Josh Todd. Goal! Annan Athletic 2, Hamilton Academical 1. Greg Docherty (Hamilton Academical) left footed shot from the centre of the box to the bottom right corner. Assisted by Eamonn Brophy. Attempt missed. Christopher Mandiangu (Hamilton Academical) left footed shot from the left side of the six yard box is close, but misses to the right. Attempt saved. Christopher Mandiangu (Hamilton Academical) left footed shot from outside the box is saved in the centre of the goal. Corner, Hamilton Academical. Conceded by Matthew Flynn. Corner, Hamilton Academical. Conceded by Rabin Omar. Substitution, Hamilton Academical. Christopher Mandiangu replaces Daniel Redmond. Corner, Hamilton Academical. Conceded by Martin McNiff. Attempt missed. Ryan Finnie (Annan Athletic) right footed shot from outside the box is too high. Attempt saved. Eamonn Brophy (Hamilton Academical) right footed shot from outside the box is saved in the bottom right corner.